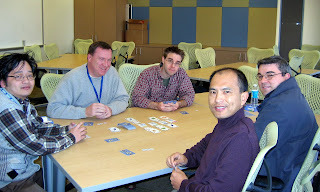 Why restrict yourself to just playing board games during lunch? You can be creative and take advantage of other opportunities to interact with your fellow developers such as say during a domain walkthrough meeting by playing footsie under the table. Or if you come across a dev in the hallway, find a piece of paper, ball it up, and once they walk past you, quickly turn around and smack them in the back of the head and run away like a third grader during recess. I'm sure you can come up with other creative ideas, and as you said "let the magic begin".